SS Jess: My Thoughts on the Possible Sequel of "Boy Meets World"
My Thoughts on the Possible Sequel of "Boy Meets World"
My friend, Daniel, sent me this article concerning the possible sequel to beloved 90s sitcom "Boy Meets World." I actually read another article about this about a week ago thanks to my best friend, Catherine. Surprisingly I haven't said anything about it anywhere except on Twitter when I was originally informed about it. But since it is becoming an increasingly popular topic of discussion, I feel a need to tell y'all on behalf of myself (and I'd like to think all diehard BMW fans) how I'm feeling about it. Honestly, I can't say I'm excited. "Boy Meets World" is unarguably the greatest show to come out of my childhood, and it could never be replaced. In a time where the most popular Disney shows are centered around teen pop sensations, wizards, and twins living on a cruise boat (without their mom I might add), I really worry that this sequel will not do the original justice and possibly even embarrass it. I learned some of the most valuable life lessons from Mr. Feeny and Alan and Amy and Chet Hunter, and the relationship between Cory and Topanga is the most pure and true I've ever seen. And I don't think I even need to mention the friendships between the characters. As much as I would like this spin off to be successful, I just don't see how it will work during this time in entertainment television. I worry that the producers will be more concerned with the ratings than keeping the integrity of "Boy Meets World" intact. And I really am sorry for being so dramatic about it, but I am a diehard Boy Meets World fan. (Obviously. Check the name of my blog or the fact that I own all 7 seasons on DVD.) I, honestly, would be devastated if it was made into a joke. Also, this particular article says Cory and Topanga's daughter would be named Riley. Any true fan would remember from season 7 episode 16 "Seven The Hard Way" that Cory and Topanga named their daughter Beverly Glenn. 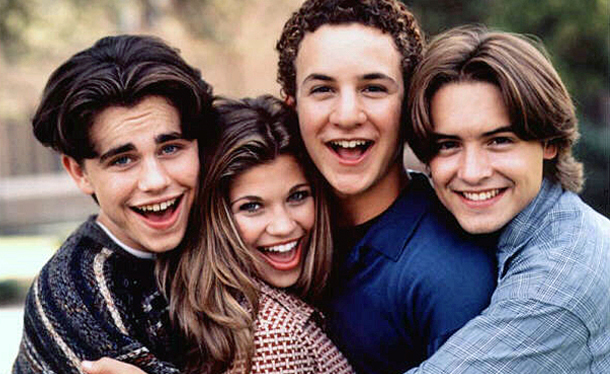 How do you feel about a sequel to "Boy Meets World"? Leave a comment on this post, and let me know!